Kin and I spent Friday and Saturday at Davidson College at a “Indie Ed-Tech Data Summit.” I have a ton of thoughts about content, community, process, definitions, outcomes, funding that I thought I’d quickly write down while it’s all fresh in my mind. (Heh. This is already 2000+ words.) Several of these issues are worth writing up in more detail – and I probably will. Eventually. Here’s a link to the transcript of my talk. Here’s a link to the slides on SpeakerDeck. Here’s a link to a soundtrack (with some of the songs that I mentioned in the talk) on Spotify. There were several major points that I hope my talk made: 1) “open” scholarship matters for knowledge-building (I hope that those of us working in Indie Ed-Tech model this by posting our thoughts on our blogs). 2) students should be given to the technological tools to participate in open scholarship and knowledge-building – that is, at the very least, students should own their own domains. 3) controlling your own scholarship – content, IP, data, metadata, privacy levels, security, identity formation and performance, community participation – is crucial. 4) ed-tech industry interests want to shape and control all of these, and that’s a dangerous (or at least very very dull) proposition. We can build something different. 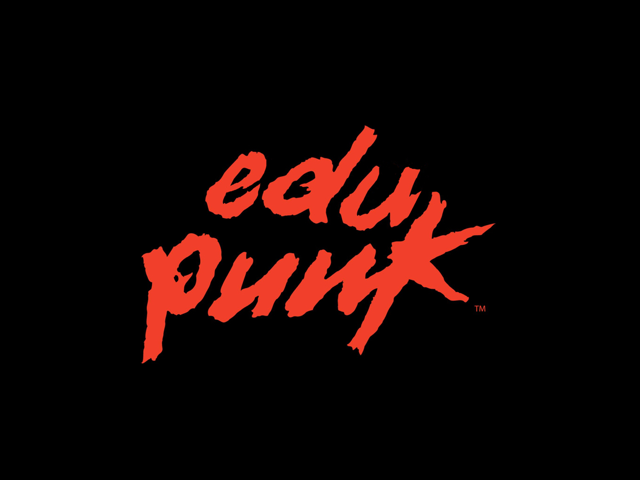 Since Jim Groom coined the term “edu-punk” – co-opted almost as quickly as British punk rock was – musical references have been key metaphors in talking about alternatives to “mainstream” and “corporate” education technology. I tried to extend the metaphor in this keynote, building off a talk that Jim and Adam Croom gave at Stanford last fall, referencing in particular the algorithmic promises made by the music industry. How do you identify the perfect hit song? How do you make the perfectly personalized playlist? The push for the latter – “personalization” – is clearly evident in ed-tech. What will be the results of an algorithmic “personalization”? What will the future of education look like (or to use the music metaphor, “sound” like)? Speaking of sound, when I set about writing a talk to deliver “live,” I think quite differently about the rhetorical moves I’m going to make than I do when I’m writing something that others will simply read on their own. Arguments in keynotes and public lectures aren’t quite the same – or needn’t be quite the same – as arguments in essays. (Some of this has to do with the performance element; some of this has to do – ugh – with having slides.) The challenge then is when I do publish the transcript of a talk, and it becomes an essay. There are expectations from readers about what an argument in an essay is supposed to do, what it’s supposed to contain, what “proof” looks like (or to use the music metaphor, “sounds” like). This was the third or fourth (or more?) time that I’ve attended a hackathon-of-sorts around the issues of Indie Ed-Tech, and this one benefited greatly from the “design sprint” process led by Known’s Erin Richey and Ben Werdmüller. In the past, these events have spent a lot of time talking about the tools and initiatives that we all were building, and I did miss hearing about what other schools were up to – I’m particularly interested in the Personal API work that’s happening at BYU and at the Domain of One’s Own initiatives that are spreading across campuses. But in some way, it was smart to skip that part and to work instead on ideas and possible projects that emerged from the activities Erin and Ben led us through. Ed-tech need not be exploitative. Ed-tech need not be extractive. Ed-tech need not be punitive. Ed-tech need not be surveillance. Ed-tech need not assume that the student is a cheat. Ed-tech need not assume that the student has a deficit. Ed-tech need not assume that learning can be measured or managed. Ed-tech need not scale. But for me at least, I’m okay with leaving things a little open-ended, emergent, messy, and undefined – or at the very least, not so circumscribed it’s quickly or easily co-opted and sold right back to us as the latest ed-tech upgrade or Gates Foundation-funded effort. What Is a Personal API? All attempts to avoid definitions aside, for me, an essential element of Indie Ed-Tech does involve control of one’s “personal cyberinfrastructure.” It’s not simply about controlling one’s domain/data/content as the end-goal; but it is about recognizing how control of these elements is always intertwined with questions/practices of knowledge, identity, and power. I once made a joke – one that Kin will never let me live down – that APIs reduce everything to a transaction. I’d like to crack open what we mean – technically, philosophically – by “transaction” so that it isn’t simply an invocation of economics. So that its synonym “interaction” isn’t simly “clicking.” Perhaps we can think of Personal API and “reciprocity.” Perhaps “exchange.” Perhaps, as Mark Sample used the word “transaction” to describe a comment I made in my keynote, “social contract.” That raises many questions, in turn, again, about information, social structures, and power. I got word today that a decently-funded startup – it has raised over $7 million in the two-and-a-half years of its existence – has run out of money. While the co-founders will, for the time being, work to “keep the lights on,” it’s fired all its staff – some 30-odd employees. So let’s dismiss from the outset this notion that, in order for ed-tech to be sustainable, it has to be venture-funded. Indeed, by their very definition, tech startups are not sustainable: they are high risk, and although the return on investment might be high if a company is acquired or has an IPO, neither of those are particularly common occurrences. Most startups fail. On the final night of the Indie Ed-Tech Data Summit, Known’s Ben Werdmüller led a discussion about funding, one that he admitted was an attempt to make a case for a Silicon Valley investment model for Indie Ed-Tech, one patterned perhaps off of Matter, a media-focused startup incubator program that’s invested in Known. It does sound as though the startups that are backed by Matter work closely with the organizations and companies that are limited partners in the fund. These organizations – as investors – shape the types of products that their investment portfolio develop, partially through the design process that the attendees at the Indie Ed-Tech event went through. What would it look like, Ben asked us to consider, if universities became investors in ed-tech startups? What kinds of products would be built? An incomplete list of ed-tech products that started at universities and were later spun out into companies: PLATO, Blackboard, WebCT, TurnItIn, edX, HelioCampus, Degree Compass, Learning Catalytics, Cognitive Tutor (later Carnegie Learning), Udacity, Coursera. Not a stellar track record when it comes to “Indie.” As such, I don’t think the proximity to university staff or students is actually the key in differentiating “good ed-tech” from the “bad ed-tech” produced by those living in their Silicon Valley bubble. What matters more, to borrow from Tim Klapdor’s thoughts on Indie Ed-Tech: your vision for autonomy, agency, and scholarship. Simply put: I don’t think venture capital is the way to go to fund Indie Ed-Tech. Nothing makes a good thing go bad faster than that. That being said, I do recognize that questions about funding are going to become increasingly important, particularly as austerity measures kick in. …also had material effects on the kind of work we can produce, and the horizons of possibility our work can open. When we choose not to invest in our own infrastructure, we choose not to articulate a different possible version of the world. To borrow from Miriam, I think we do need education institutions to “pay up” – to invest in scholarship about and teaching and learning with technology. But should the model for that investment be venture capital? I don’t think so. There are other ways to think about funding; there are other ways to think about investment; there are other ways to build software. There are better ways to build capacity; there are better ways to think about sustainability. There have to be, right? Thanks to Kristen Eshelman and Adam Croom for organizing the Indie Ed-Tech event. Thanks to Davidson College for being one of the very few institutions that’s ever invited me back. Image credits, with apologies to Daft Punk.